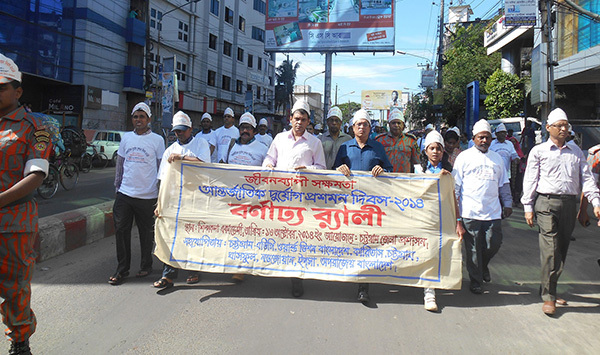 Chittagong District Administration organized rally and discussion meeting to mark the International Day for Disaster Reduction 2014 on 13th October with the theme of “Older people and disasters: Resilience is for Life”. YPSA actively took part in these events. The rally was brought on the day from the Silpakala Academy, Chittagong and moved by several important places and then gathered at the Sishu Academy, Chittagong for a discussion meeting. Md. Mezbah Uddin , Deputy Commissioner of Chittagong inaugurated the rally flying colorful balloons. Around 300 people from the community, students and from different trade of life like civil society member, NGO activist, media personnel, teacher and religious leader participated in the events. Both the events ornamented and prompted by different government officials. Mr. Abul Hossain, ADC (General) presided over the meeting and Md. 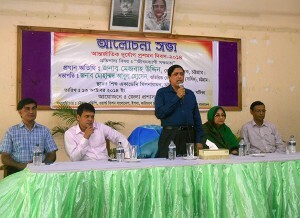 Abul Basahr, District Relief and Rehabilitation, Chittagong coordinate the rally and program. YPSA, Ghasful, Caritas, World Vision, Aprajaya Bangladesh and other likeminded organizations attended the rally to make the IDDR observation successful. Many people around the world have lost their lives, homes or access to essential facilities, such as hospitals, due to natural disasters, including earthquakes, droughts, tsunamis, heavy flooding, hurricanes or cyclones. Some of these disasters have caused economic damage to some countries. The UN acknowledges that education, training, and information exchanges are effective ways to help people become better equipped in withstanding natural disasters. On December 22, 1989, the UN General Assembly designated the second Wednesday of October as the International Day for Natural Disaster Reduction. This event was to be observed annually during the International Decade for Natural Disaster Reduction, 1990-1999. On December 20, 2001, the assembly decided to maintain the observance to promote a global culture of natural disaster reduction, including disaster prevention, mitigation and preparedness.